Bassinet baskets are the perfect place to rest your baby while you sleep. When you hold your precious baby in your arms for the first time, you won't ever want to let him go. But, like every other mom who has gone before you, you are only human - and humans need to sleep every now and again. Check out these stores for the best bassinets selection. Disadvantages Of Bassinets for Babies. 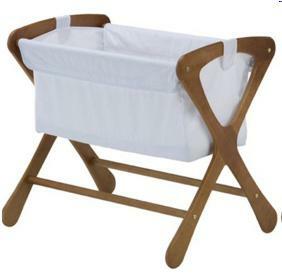 Features To Look For in a Bassinet Basket. Like baskets on a stand, bassinets usually have a hood and are decorated in the most beautiful, frilly fabrics imaginable. Perfect for your precious little prince or princess. You can reach over and soothe your baby when she wakes. This makes both of you happy - you don't have to leave your warm snuggly bed and she knows that mommy is right there when she is needed. It's easy to bring baby into your bed for nighttime feeding. You will both get more sleep. The security of a small space and closeness to mom encourage baby to develop a good sleep routine. You will recuperate from the battle wounds of childbirth more quickly if you don't have to keep getting up and down. Portable bassinets are easily moved around the house with you during the day so that you can keep an eye on your sleeping cuddle-bunny. Some portable bassinets even have rolling castors so there's no need to leave them tucked away in the baby nursery. Baby gets the benefit of nighttime closeness with Mom, in a small cozy environment. 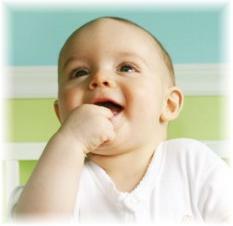 This provides your baby with the security he or she needs during the early months of emotional development. Babies of working moms can catch up on mom's touch during the night, thereby maintaining a strong emotional bond. Research has shown that babies who sleep in their parents' room for the first year are at less risk of SIDS. Organic baby mattresses and bedding are available for baby bassinets. These are highly recommended, as synthetic mattresses have been associated with an increased SIDS risk. Read more about SIDS prevention here. Many bassinet baskets can be removed from their stands making them fully portable. You will have a happy baby when you travel because you can take his favorite place with you wherever you go. Bassinets are available in a dazzling array of designs. Anything goes from the ridiculous to the sublime when it comes to these small baby beds. You are sure to find something to match your bedroom decor. So knock yourself out and wrap your prince or princess in luxury. As with all small baby beds, the main disadvantage of bassinets is that they will only serve as temporary snuggle nests. A bassinet can be used until your little bambino is around four months old, or rolling over by himself - whichever comes first. As soon as your baby starts to roll there is danger of the bassinet tipping, and you will have to move your baby to a conventional baby crib in the nursery. Other small baby beds to consider, that may last a bit longer are the bedside crib and the Arms Reach Cocoon. The bedside crib can be used until your baby reaches a weight of 30lbs and the Arms Reach Cocoon until 23lbs, regardless of age. Bassinets are easier to take traveling if the basket and frame can be separated. Check that the basket has handles long enough to meet in the middle so that you can carry the basket with one hand. Also make sure that the frame folds up for portability and easy storage. Bassinet hoods are great for when you want to take baby outside. You don't want the sun getting in his eyes. On the other hand, you may not want the hood up when baby is inside and it will be easier to lay baby down and pick him up with the hood folded back. Make sure that the retracting mechanism works smoothly - no sticking. The easier it is to move your bassinet the better. Not essential, but a beautiful touch of elegance that you'll find on some luxury bassinets. Some baby bassinets come with their own nightlights, mobiles and sleep soothers. This is one of the advantages of a bassinet when you are trying to establish a good sleep routine. Most bassinets come with a mattress included. Remember to take entertainment gadgets and bassinet mattresses into account when you make price comparisons between the various baby bassinets on the market. If they are not included, you will need to buy at least some of these items in addition to the bassinet. This is your first priority. Babies spend 60-70% of their first year in their crib. It's up to you to make sure they sleep safely. It is essential to ensure that the baby bassinet you decide on, meets the Consumer Product Safety Commission (CPSC) standards for bassinet safety as an absolute minimum. A sturdy bottom and wide base for stability. A smooth surface - no protruding staples or hardware. Strong, effective locks on the legs to prevent folding while in use. A firm, snug fitting mattress. Locks on at least two of the rolling castors if applicable. Never lift or move the bassinet with baby in it. 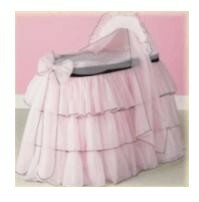 Click here for bassinet crib recalls. Most bassinets come with a mattress, however, you can buy it separately if you would prefer to consider organic bassinet bedding. Do you have a favorite small baby bed that you couldn't do without? Let us know and write a review of your favorite small bed for your baby. You'll be entered in our current giveaway. 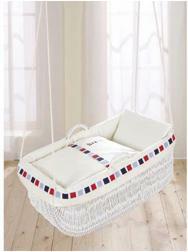 Baby bassinets are a wonderful way to pamper your newborn in the luxury she deserves. Please be aware that the baby bassinets information provided by Creative Baby Nursery Rooms is for the purpose of helping you to decide on the best baby bassinet for you. Upon making your choice, it is your responsibility to ensure that your preferred baby bassinet adheres to the CPSC bassinet safety standards.